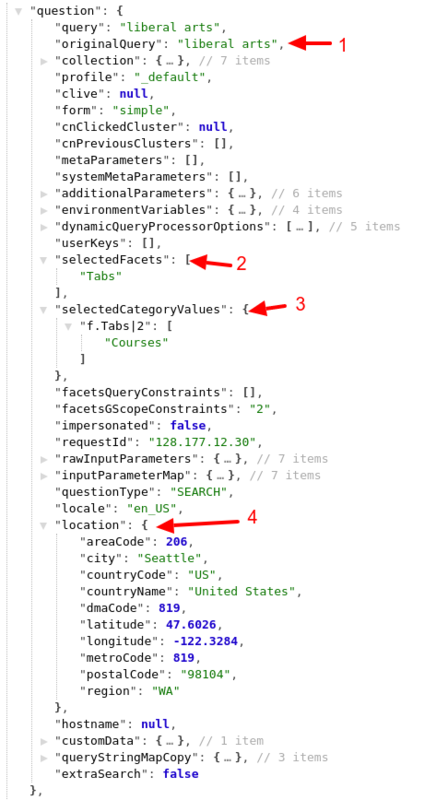 This page gives an overview of the most commonly fields used withing the question and response nodes, needed to implement a standard search results page when integrating with the JSON or XML endpoint. For more details about the data model, see the official documentation page. See also the complete data model reference with the list of all existing nodes. 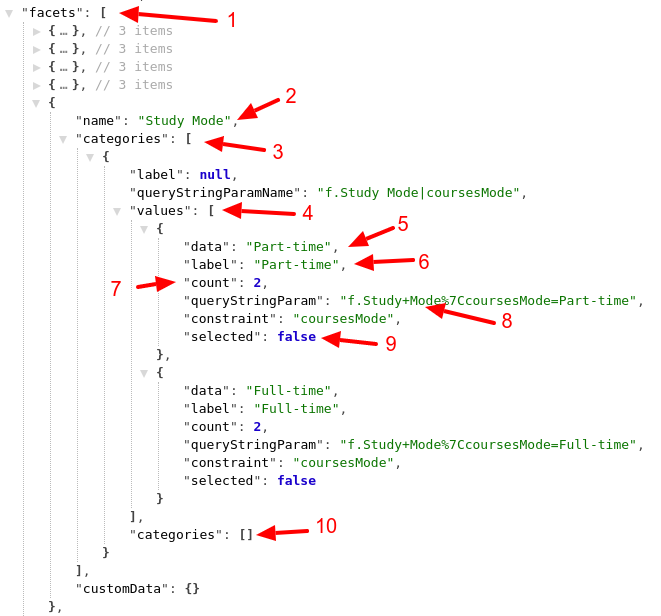 It is highly recommended to install a browser extension to pretty-print JSON and XML, to make it easier to explore the data model. 1 originalQuery Search keywords as entered by the user. Useful to display messages like "10 results for <originalQuery>"
3 selectedCategoryValues Pair of Key / Value for currently selected facets (e.g. "Tabs = News" or "Product category = Phones"). Useful to show the currently applied filters. 4 location May contain information about the users' location derived from their IP address. This may not always be available. The results summary contains information used to display result counts (e.g. "Showing result 1 - 10 out of 3,240 for <query>") and implement pagination. 1 fullyMatching How many search results match the entire search keywords. For example with the search keywords "chocolate cake recipe", only 11 documents may match those 3 words, but 44 documents may match "recipe"
2 partiallyMatching How many search results contain some of the search keywords, but not all. 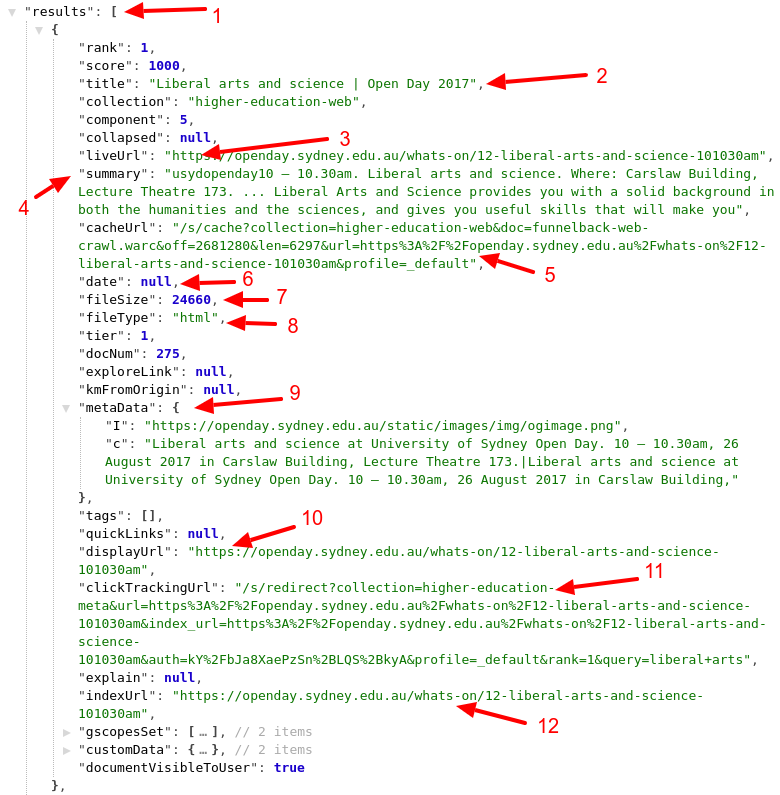 9 metaData Key / Value pair for each metadata associated with the result (e.g. "productCategory = phone"). 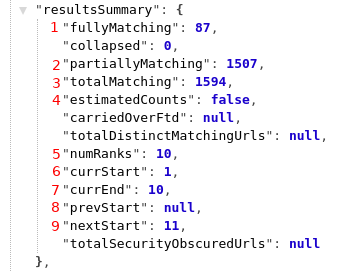 Note that if a metadata field has multiple values, they will be separated by the pipe character "|"
11 clickTrackingUrl The URL to use for clicking on the result, so that Funnelback can track the click in Analytics. This URL will record the click then transparently redirect the user to the original result URL. Facets are used to provide results filtering, as well as tabs. 3 categories List of categories configured for the facet. This list may contain a single entry, with multiple values inside (see next row), or multiple entries with a single value inside, depending on the facets configuration. 4 values List of values for the facet and category (e.g. the actual list of tabs, or list of product categories: "Phone", "Tablet", etc.). 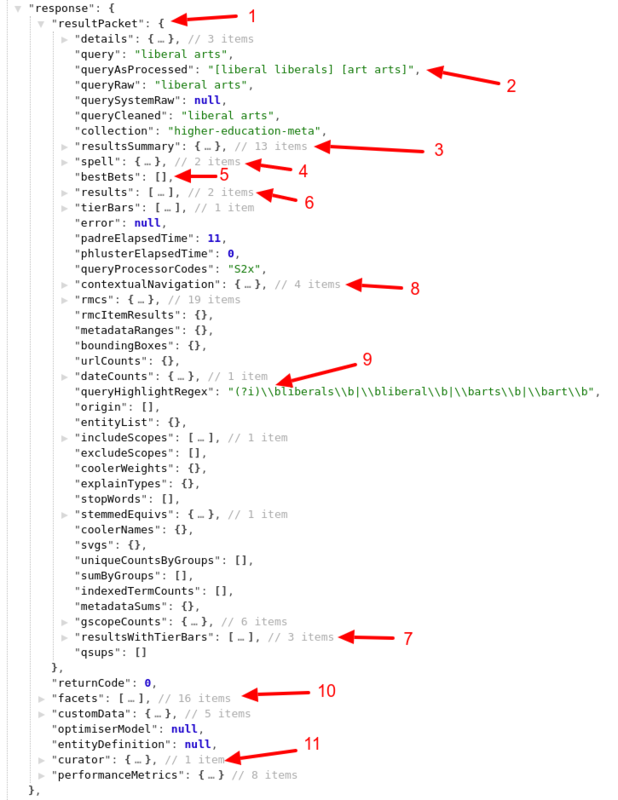 8 queryStringParam The URL constraint to use to select this value. To select the value, use the current search URL and append the queryStringParam to it. 10 categories List of sub-categories, for nested facets. Usually empty on simple facet setups.